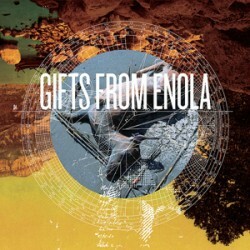 Gifts From Enola should be fairly recognizable to anyone into the post rock scene at this point. The Virginia based band have been putting out music and logging road time for the better part of 6 years at this point. The band have worked hard to progress their dynamics-laden post rock sound. So it comes as little surprise that after the well received From Fathoms LP the band went back into the studio to write more songs. With their chosen style most bands are good to zone out to without giving the listener anything to hold onto after the record has ended. Gifts tens to avoid this by including strong guitar hooks within their ambient / heavy dynamic. This record in itself begins with a strong opener "Lionized". The song progresses quickly into its many pieces making for an interesting if not slightly disconnected 8 minute opener. The song seems disconnected from the rest of the record as it plays to many of Gifts' strengths and adds additional layers but seems to have trouble keeping them connected at all times. In addition to this it ends with a turn of the century style jingle making it more separate from the rest of the songs. While this is the case Lionized also acts as the strongest song on here. The track does a good job of encapsulating the bands sound in a smaller dose. The songs follow a similar consistency at times gets a bit more metallic or technical and more ambient and calm otherwise. All of these things are not entirely distinct to Gifts of Enola rather they work hard to make them their own. In the meantime "Dime And Structure" plays with including vocals into their usual sound. This gives the song a more traditional feel without losing their edge as the vocals sink into the mix sounding distant and desperate. The production is stellar allowing for each instrument to be heard and carry it's weight in the mix. The drums pound with a fervor that carries the songs and allows everything to be anchored throughout the proceedings. this not only gives some heft to the songs it allows the other instruments to further explore some of the more spacey tendencies that they exhibit at times. The use of vocals in the mix makes for a much different recording style than most bands of their style that have no need to worry about such things. In this case the vocals tend to get buried in the mix instead of ever taking a lead of any sort. The band have worked hard over the past few years to cultivate their fanbase and write strong songs. Unfortunately only one of the two came to fruition. This record as beautiful and smart as it is, still feels incomplete at times. Do not get confused each song is, by itself, interesting and bearing strong composition unfortunately the songs don't feel entirely connected to each other. 7.7 / 10 — Jon E.
Posted July 25, 2011, 9:46 a.m.
Posted Oct. 13, 2016, 9:01 p.m.
Posted Aug. 29, 2016, 2:03 p.m.